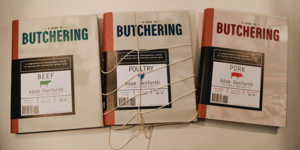 Chefs Collaborative – Ohio River Valley, in collaboration with Midwest Culinary Institute and Creation Gardens, presented two workshops with Adam Danforth, who is the James Beard and IACP award-winning author of two books about slaughtering and butchering livestock. Danforth teaches workshops and lectures nationwide for venues such as Stone Barns Center for Agriculture and the James Beard Foundation Chefs Boot Camp. Danforth also works with individual farmers who are slaughtering animals for themselves, and because of that, he has a keen awareness of the needs of farmers, especially those who may be killing an animal for the first time.